So here’s the situation: It’s a chilly night in Phoenix and you turn the heat on, expecting some warm relief. Instead, you’re blasted with cold air. Yeah, that’s a lot of possibilities. So, how do you know which problem is causing your furnace to blow cool air? Well, lucky for you, that’s where we come in. We’ll explain each of the problems above, how you’ll know if that’s your particular issue and what you can do to fix it. Need a tech ASAP? Just contact us. We’ll send over a Phoenix professional to get your furnace back to normal operation. Yeah, we know the first one seems like a pretty silly problem but you’d be surprised by how many residents in Phoenix leave their thermostat set to COOL year round and just forget about their HEAT button altogether. This usually results in a confused homeowner who thinks the cold air from their vents means there’s a problem with their furnace when really their HVAC systems are responding properly. 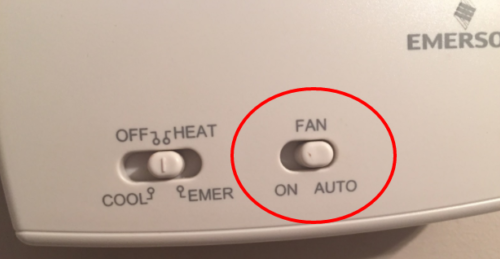 Now let’s talk about an even more common reason a furnace might blow cold air: you’re using the wrong fan settings. Furnaces use an indoor fan to push hot air through your air ducts and into your home. But that fan has two modes of operation: ON and AUTO. If your furnace fan is set to ON, the fan runs continuously, whether or not your furnace is producing heat. So, once a heating cycle ends and the furnace burners cut off, the fan continues to blow. And because your furnace is no longer heating, the air being pushed into your home will be cold. Go to your thermostat. Make sure your thermostat is set to HEAT and your fan is set to AUTO. 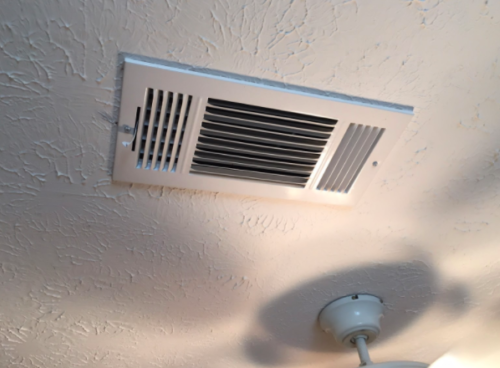 If this doesn’t stop the fan from running constantly or if you’re still getting cold air from your vents in heating mode, have a professional inspect the unit for more complex issues. Leaks in your ductwork means that cold, unconditioned air from inside your attic gets sucked into your ductwork. That cold air mixes with the warm air from your furnace, causing the air coming from your vents to feel considerably cooler than it should. Unfortunately, you’ll need a professional to fix this problem. 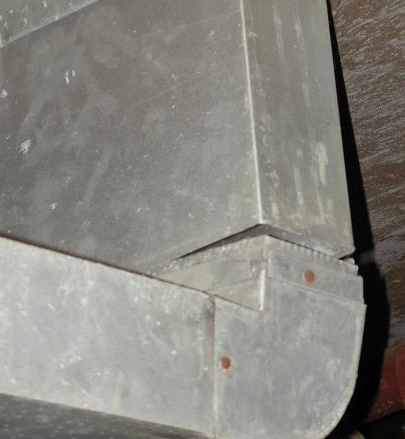 Have a technician inspect your air ducts for leaks and provide the best solution. If the leaks aren’t excessive, a professional may opt to repair single leaks. If leaks are excessive, you may want to consider sealing your ducts. 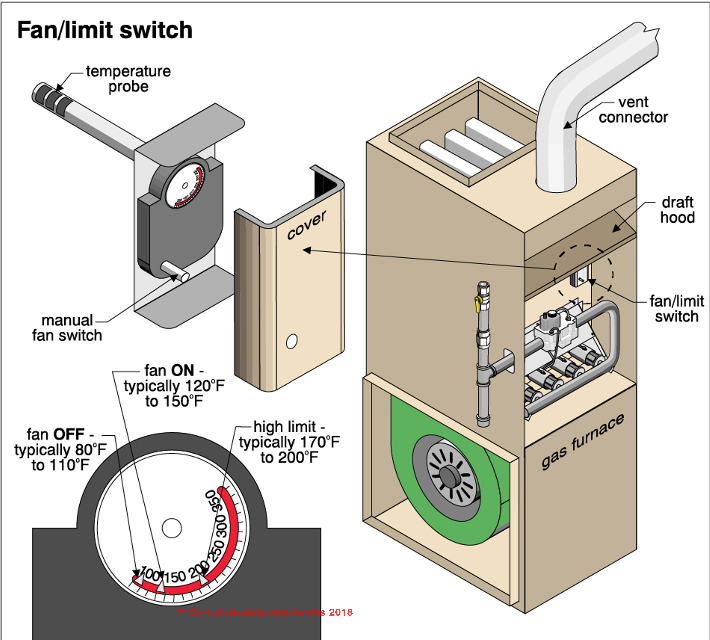 Your fan limit switch is located just under your furnace hood and is in charge of telling your furnace blower when to come on. Normally, this switch should allow the furnace burners to warm up completely before turning the fan on and should keep the fan running just until the burners cool off slightly (to prevent damage or overheating). Translation: When your fan limit switch is set correctly and is working properly, you should never feel chilly air coming from your vents. Have a professional inspect the fan limit switch. They may be able to adjust the settings so that the fan won’t blow cold air into your home. But, if the switch is bad, they’ll need to replace it. Your furnace blows hot air but that air quickly turns cold then the furnace shuts off altogether. This “hot then cold air” sequence happens over and over and your home isn’t warming up. If your furnace is overheating, that means your heat exchanger is getting too hot. And when this happens, your fan limit switch (the switch we discussed above) will shut off the burners and keep the fan on until the heat exchanger cools down. Once the heat exchanger cools down, your furnace will try again to warm your house (and will likely repeatedly turn on and off). Meanwhile, you’ll get cold air because the fan continues to run as a safety measure, even after the furnace isn’t producing heat. 1. Check your air filter. If the filter looks like the filter to the right in the picture below, replace it. 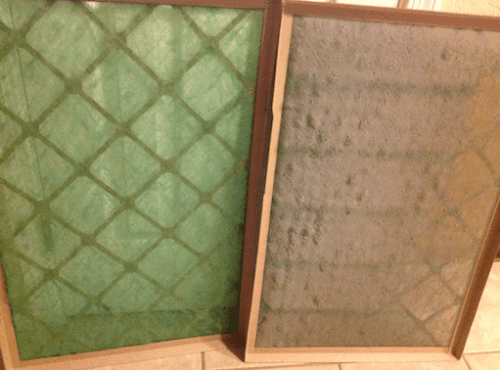 You see, a clogged filter restricts the amount of cool air that runs through your furnace’s system and causes the unit to quickly overheat and shut off. 2. Check that all supply vents are open. Your supply vents (pictured below) push warm air into your home. But if you close too many, it increases pressure inside the duct system. 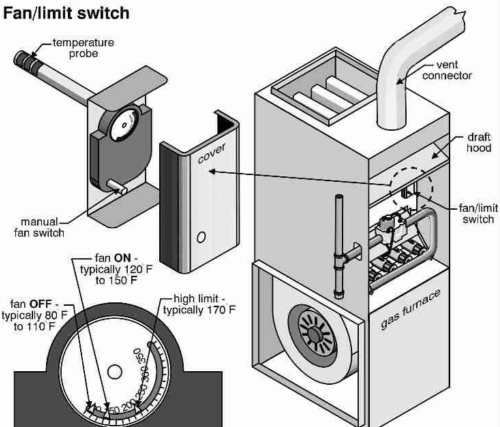 This extra pressure puts strain on the furnace blower, slowing it down. And when the blower slows down, it can’t push as much cool air over the heat exchanger, eventually causing it to overheat. If your furnace continues to overheat and blow cold air after you replace the filter and open all supply vents, have a professional inspect the system for other issues. If you’re still not getting warm air from your furnace, we can help. Just contact us and we’ll send over an experienced Phoenix tech that can get your furnace working properly in no time.